March means another fun challenge for our Enjoy Life Foods Friday posting! This month, I admit, seemed more challenging than past months. 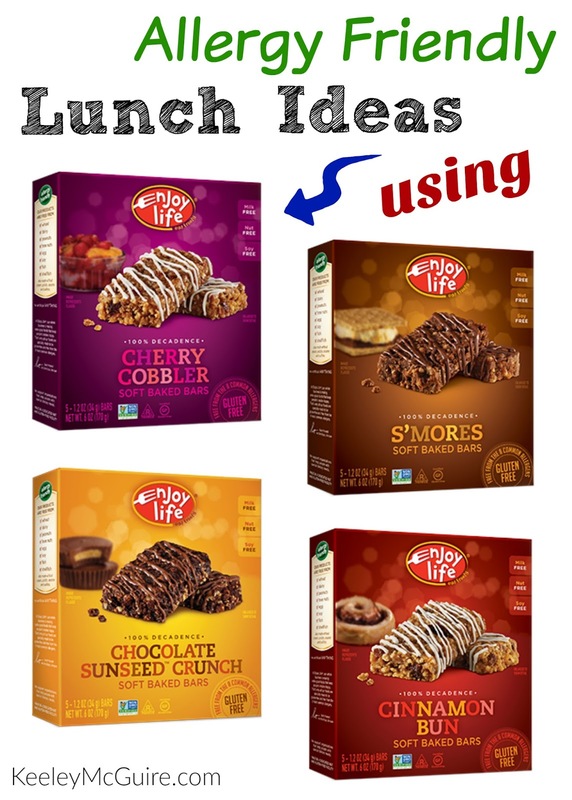 In the end, however, we came up with some delicious and creative ideas to use Enjoy Life Foods Decadent Bars for lunch & more! The bars come in four yummy flavors: S'mores, Chocolate SunButter, Cherry Cobbler, and Cinnamon Roll. They're gluten free, top 8 allergen free, and verified by the Non-GMO Project. The first flavor we tackled was the S'mores bars. You see, this month was particularly challenging because these Decadent Bars are exactly as they're named: Decadent. Full of flavor and sweetness. So trying to come up with ways to utilize them or add to them was tricky. 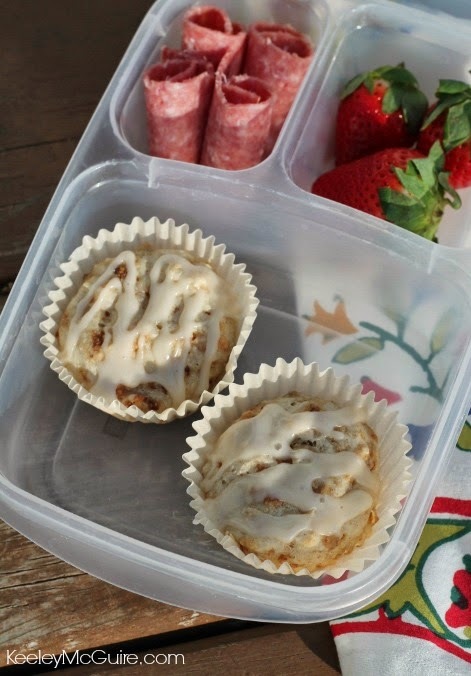 You can really enjoy them for dessert at home, or let them cool and pack them up in a lunch box. Little Miss and I took two S'mores bars and cut them in half. I also took one marshmallow and cut it into quarters, since we didn't want to add too much. 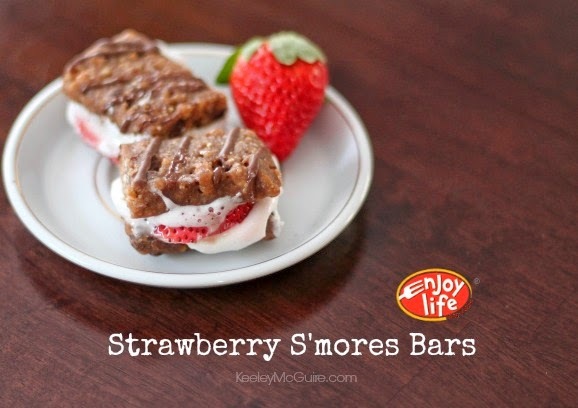 I then sandwiched the marshmallow and a strawberry slice between the bars and zapped them in the microwave for ten seconds - just enough to make the marshmallows sticky & squishy. Yum! The warmth of the quick zap and the melting mallow softens the bar, as well, making it sinfully delicious! Yeah. We did that. And then Little Miss went into a dessert coma with a smile on her face. Seriously though... easy and amazing. I lined a bread pan with parchment paper and laid my Chocolate SunButter bars across the bottom. I had let our ice cream set out to get soft so that way I could easily spread it over top. Then, of course, I added Enjoy Life Foods Mini Chips over top. Cover and return to the freezer just long enough for the ice cream to refreeze so that you can slice it - I let mine stay in there for about 30 minutes. Remove the parchment paper from the pan so you can easily slice along the bar lines and serve immediately. You're welcome. Okay, okay, back to business... Cherry Cobbler. When I was thinking of "cherries", I started to think of all the foods I like to eat them with - pie, cobbler, etc... and BOOM, salad! I love when I get a delicious salad with dried cherries on it. So delicious. Typically served with grilled chicken over top and a balsamic dressing. So, why not transform these bars into a delicious baked chicken bite? After pulverizing a box of Cherry Cobbler bars in my food processor, I added them to a mixing bowl with 1 lb. 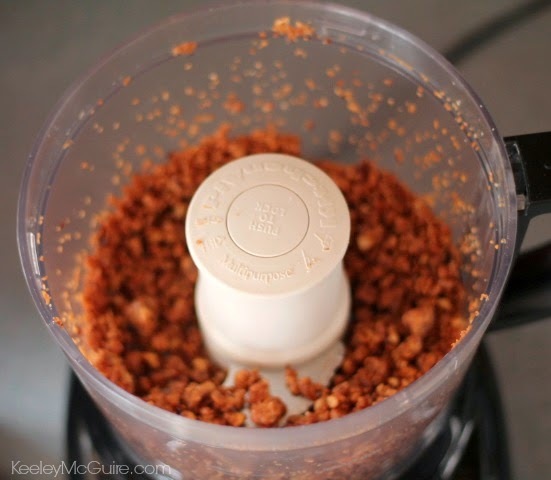 of ground chicken. That's it. Just processed bars and chicken. I formed them into "nugget sized" shapes on a parchment lined baking sheet. Tip: The mixture can be sticky, so keep a small bowl with cold water close and you can dip your fingers in it lightly to help. Bake at 350 degrees for about 25 minutes and BOOM. 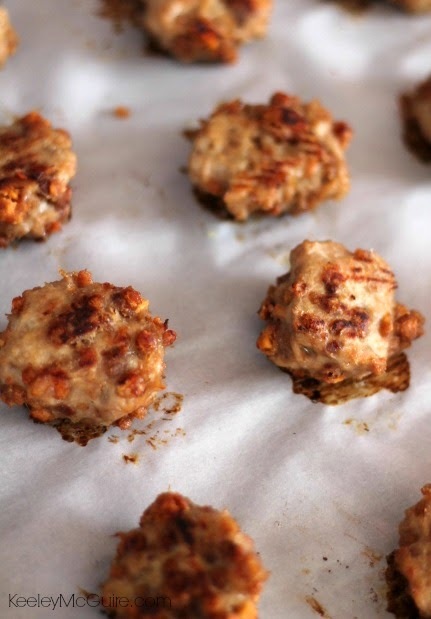 Yummy cherry chicken bites. Now you might be thinking... um cherry and chicken? Yes, trust me. It's awesome. When you bite into the chicken you get these little pockets of sweetness that catch you by surprise. Counter that with a balsamic dressing over a salad and it's nothing short of AH-mazing! 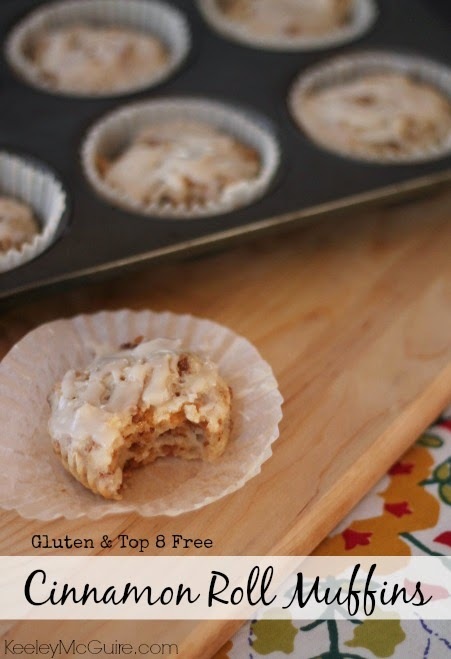 For those of you who are gluten free, when was the last time you had a good cinnamon roll? I mean a really good one? The ones that have the slight crunch on the outside and a gooey doughy inside that just melts in your mouth? Yeah, been a while, huh? For us too. Let me tell you, the joy that was on my daughter's face when she bit into this recipe was nothing short of pure delight. Shock, savory, and pure delight. The flavor and decadence comes from the Cinnamon Roll bars. The recipe itself is gluten & top 8 free. 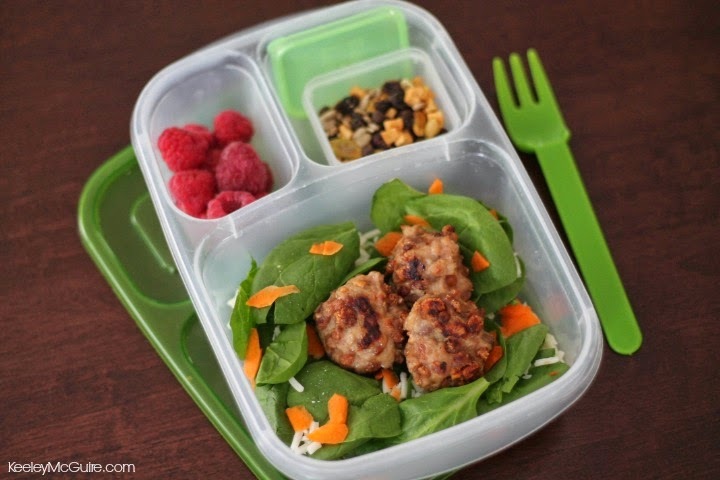 It also makes for an amazing "Breakfast for Lunch" packed for both kids and parents. 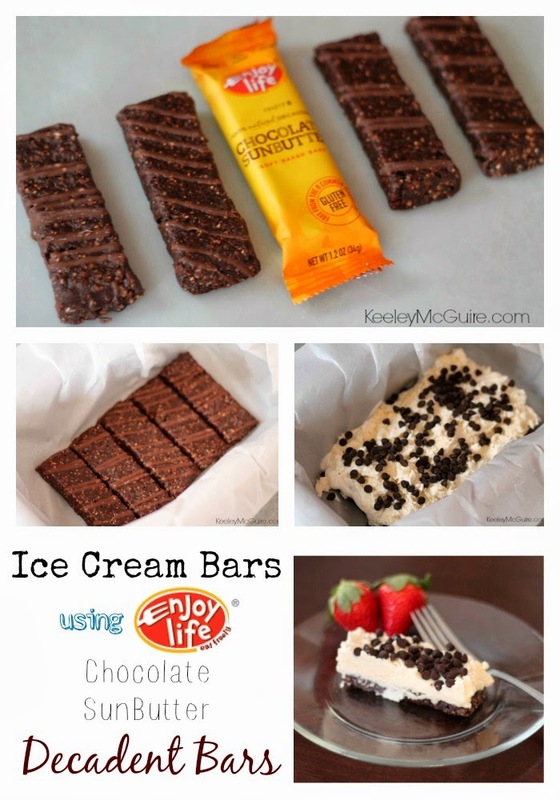 What kind of ideas come to your mind when you think of reinventing Decadent bars?